Franks’ team with the Harris County Senior Softball League. (He’s second from left on the bottom row). Outdoor kitchens and covered patios may be our professional specialities, but there’s another area Outdoor Homescapes excels in – community giving in Houston. Well, it just feels good! Just last Friday, for instance, we attended a ribbon-cutting for Literacy Advance of Houston, to which we’d donated two thousand dollars’ worth of outdoor design services in early spring. 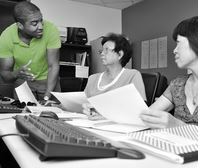 Since 1964, Literacy Advance of Houston has helped people become more self-sufficient and reach other personal goals through literacy. Friday’s ribbon-cutting was for the group’s new Cameron Computer Lab (left), which in addition to meeting basic literacy needs will produce self-sufficient individuals ready for work. 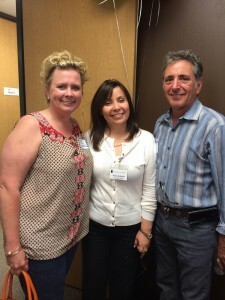 Diana Delgado, transition coach for Literacy Advance of Houston (center), with Outdoor Homescapes’ Gretchen Kliafas and Wayne Franks at Friday’s ribbon-cutting. And you know what? Just being at the event and meeting the people who will be running — and benefitting from — this program felt really great! Maybe thinking about others gave me a break from the stress and worries of my own day. Maybe it was that feeling of doing your part or having a larger purpose in life. Or maybe it put the blessings of my own life – even something as basic as being able to read – into clearer perspective. Whatever it was – it made me feel good. I first learned about the benefits of community giving in Houston through my involvement with sports. At first, it was just fun for me – a lifelong sports fan and coach – to participate in something I enjoyed. But then, as I saw more and more how athletics improves lives, I started getting more involved in the charity side of things. 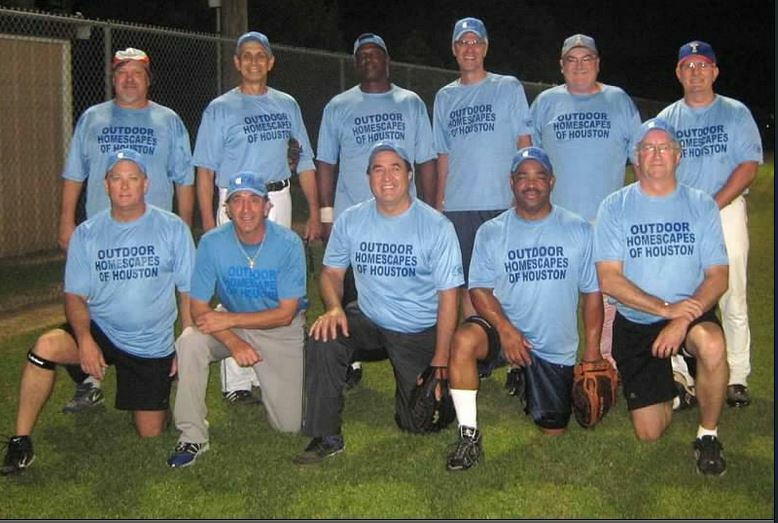 I’ve sponsored an Outdoor Homescapes of Houston team in the Harris County Senior Softball League for four years. Then there’s the $2,000 outdoor design services package we’re donating to Houston’s Miracles Baseball Academy. Founded by Mike Harris, a former pro baseball player, coach and scout of the St. Louis Cardinals and Chicago White Sox, this academy builds character and life skills while teaching baseball and softball. (Left): Miracles Baseball Academy team. (Far right): Mike Harris. And then there’s the Miracles League offered by the Langham Creek branch of the YMCA of Greater Houston. This all-volunteer, not-for-profit group gives kids with disabilities the chance to play baseball as part of an organized team at no cost to their family. Last year, Outdoor Homescapes helped the team move closer to its dream of a new sports complex, by donating $3,000 toward 610 Sports Radio’s 2013 Yuletide Drive. This past year, we’ve also donated outdoor design services to a wonderful charity called Operation Finally Home. The goal of the program is to build homes for returning soldiers and widows of the fallen. The goal of the program is to build homes for returning soldiers and widows of the fallen. Question: Have you done any community giving in Houston? Do you agree with the 2010 Do Good Live Well survey that giving makes you happy? Leave a comment and tell us about it!